Pattern and instructions to make a fabric, soft sculpture cradle. This will be a fun project which will be rather inexpensive to create. It requires very small amounts of supplies and lends itself well to using up left over items. It's time to add the bedding for our cigar box doll bed. This is a very easy, small project that you can add your own creative touches to and make it truly your own. This week we will work on turning our cigar box into a doll bed. Here are Instructions and photos to make a crocheted shoulder bag for 18 inch dolls, such as American Girl and Magic Attic. 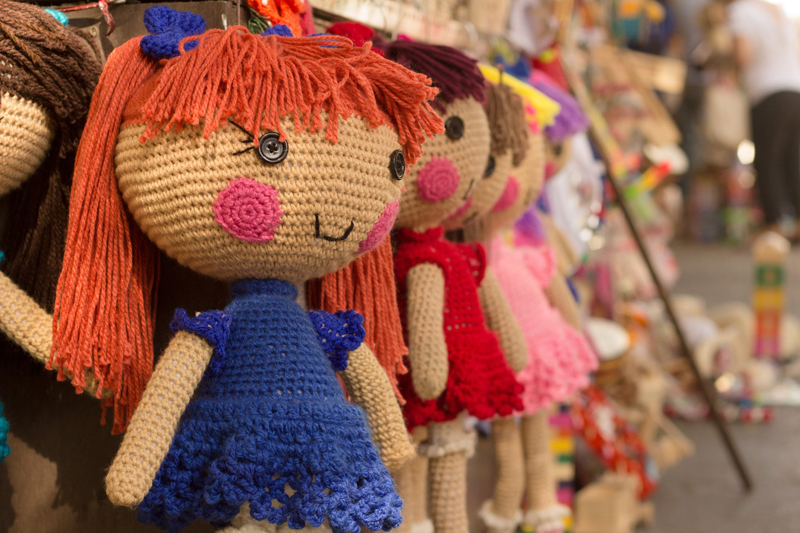 I visited a doll shop, this week that is an absolute delight for doll lovers. Here is a cute idea for decorating your doll studio. This is an easy project which you can make in no time at all, especially if you use a sewing machine. Easy instructions to crochet a bib for your baby doll. Here is instructions to knit a simple blanket for your doll. It is easy to adjust for different size dolls. Here are instructions to make an easy blanket for your doll, and it doesn't require any sewing. When we make doll cloths we try to make our dolls look as pretty as possible. Why not add some jewelry to the outfit? Knit these easy, and quick to make, booties for your dolls. The directions are given in three popular sizes. Here are instructions to make a knitted hat and scarf for your 18 inch dolls. Your doll needs a warm blanket as much as you do, here´s an easy pattern for creating a knitted one. Pretty bows on stretchy head bands are so popular for baby girls, and for very good reason. Generally, babies do not have enough hair to put a bow with a clip in, but a nice stretchy band will keep a pretty bow in place. They do exactly the same thing for baby dolls. Here are patterns and instructions to make hangers for your doll dresses from recycled materials, in two sizes. In this article I will review Lesley Riley's TAP Transfer Artist Paper by C&T Publishing, and compare it to Avery Personal Creations InkJet Stretchable Transfer Sheets. This content was written by . If you wish to use this content in any manner, you need written permission. Contact Helen B. Wharton for details.